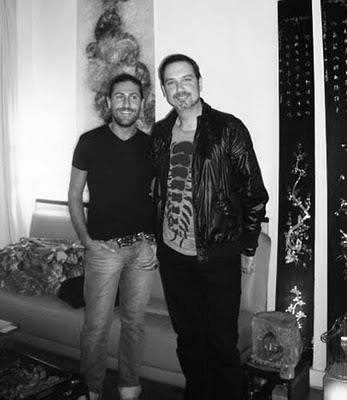 In September 2009, I had the pleasure of meeting with jeweller/perfumer Olivier Durbano in his home atelier in Paris' Marais. Below is my interview, published in Issue #2 of Basenotes Magazine in 2010. For a number of days now, I have felt unimaginative and overwhelmed. As I power up my iMac again - fingers strumming impatiently on my desk whilst waiting for the spiralling pixels on the screen to cease and the interface to load - I imagine the substantial task ahead of me. I double-click the file on my desktop named Olivier Durbano Visit and it opens on command. My eyes instantly narrow to thin slits as the brilliant white of the document causes my pupils to contract. The cursor flashes with a sense of urgency in the top left corner of the page. Still empty. My eyes drag around the room and across my cluttered desk, looking for welcome distractions. Quick facebook check. A rummage in my pen-jar. At the back of my mind, I wonder how I can cohesively recount my extraordinary experience in Paris with this man whom I have come to admire. I shuffle some papers around and reveal two highly polished fluorite cabochons on my desktop. I take one and close my hand around it. It is extremely cold, but not unpleasantly so. Regarded as a semi-precious stone which metaphysically encourages a sense of heightened concentration and objectivity; I sit for a moment hoping for my analytical abilities to sharpen. The second stone, I lift between my thumb and forefinger, and hold it up to the light. I look into its dark purple and emerald green heart to see if I can find my inspiration there. For just a second, I step outside of myself, and imagine what I might look like to a passing bystander. It suddenly dawns on me that I am engaging in an ancient practice that has diffused down through the millennia. 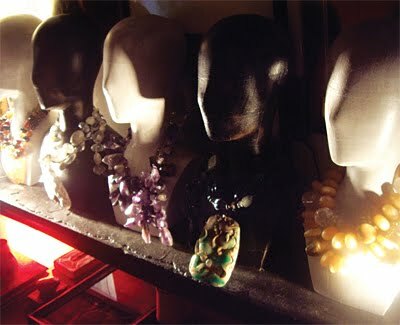 For thousands of years mankind has been enchanted with semi-precious stones for their value both physical and esoteric. I set the cabochons down carefully in front of my keyboard and start typing; confident that they will inspire me as they have the man who has devoted his life to harnessing the essence of stone through both his jewellery and his perfume: Olivier Durbano. When I first arrive outside the Parisian home of Olivier Durbano, I discover the double-doored buildings along the Rue des Francs Bourgeois conceal delightful 17th century cobbled courtyards and lush gardens. I am struck by a sense of whimsy and feel I am glimpsing at a piece of Paris that existed long ago. Monsieur Durbano emerges from a door off to my left and, with a broad smile, invites me to his home atelier on the first floor. Entering his studio, I am immediately conscious of the scent of Omani frankincense burning from a concealed censer. I stand for a moment, admiring the centuries-old exposed wooden beams across the ceiling and quaint paned windows which frame charming vistas across the central courtyard. 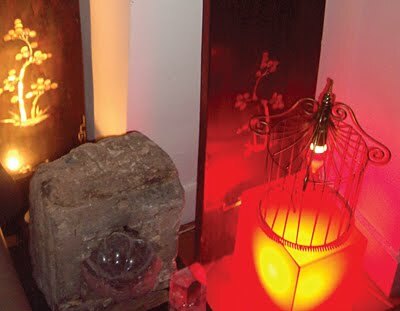 The apartment is tastefully decorated with exotic artefacts that Olivier has collected from his travels - objects that speak their own cultural or historical narrative. As I remove my coat and am ushered to a comfortable sofa, Monsieur Durbano asks if I would care for some champagne. I agree, and he exits the room, leaving me under the anonymous gaze of an audience of mannequins whose necks are decorated with semi-precious stones. I admire the heavy baubles of amethyst, jasper, carnelian and jade, and pour over several tiered wooden trays laiden with jewels. Daisy-chains of polished gems are delicately strung amongst raw minerals that look as though they have just been struck from the earth... the contrast of shapes and textures just beg that they be held. I extend a hand, but withdraw it immediately as Olivier returns with champagne and canapés. He sits opposite me on the foot of his bed and I thank him for granting me the opportunity to visit him in his personal space. He smiles broadly, knitting his hands together over his knee and explains "Non! This is also my workspace. It is only natural we meet here!" Olivier, I find fresh-faced and excited, having just returned from the Pitti Fragranze expo in Florence, Italy. "I spent many days hanging out with Andy Tauer and Mona d'Orio. We had much fun, just like school children", he says, throwing is head back and roaring with laughter. The more we speak, the more I observe this genuine boyish charm emerge. "It was a very friendly atmosphere, and totally non-competitive" he adds. "These forums are very new but also very important to me", he says, "it is always a good idea to stay on top of what is happening in the industry". I respond by telling him I've heard that the perfume industry is only really 25% about perfume, and he bellows with laughter again. "This is true, this is true", he agrees, cradling his champagne flute with both hands. "In this industry...", he adds, "...there is a high road and a low road with how you can deal with things. Where many may choose to take the low road, I will always take the high one". I feel he is sincere. The conversation shifts to his jewellery - the inspiration behind his perfume. "Stones have always been in my life" he says. "My parents told me that my very first childhood tantrum occurred when I was 5 years old when I saw a stone that I wanted. It is not a special stone, but I liked it, and I went crazy", he says, a little embarrassed. "I have kept it all these years", he adds, reaching beside his bed to retrieve a grapefruit-sized grey rock. He places it in my hand and it is heavy, ordinary, and aside from a few twinkling facets, rather uninteresting. I am impressed that he has carried it with him through the years, and it is still awarded pride-of-place amongst his far more attractive treasures. "When I was returning from the expo in Italy, I experienced big problems with customs. My pockets and bags were full of my precious stones, and I was stopped and asked: 'Do you have minerals?'. When they saw what I was carrying, they threatened to confiscate them all, and I had tears streaming down my cheeks". Olivier draws an invisible arc under each eye with two index fingers. "I am fortunate they let me take them". I am beginning to get a good sense of precisely how passionate Olivier is about his craft. Olivier Durbano creates jewellery for international customers - many are one-off pieces for clients in far-flung locales like Saudi Arabia. When I ask where he sources his stones from, I see his eyes drift beyond me, as though he were looking straight through the wall behind me and off into time and space. "The earth is made of stone. Stones are everywhere. I mix a lot of sources from around the world. Sometimes I can see something special in a raw piece of stone, otherwise I design the cut of each stone, and have it fashioned. 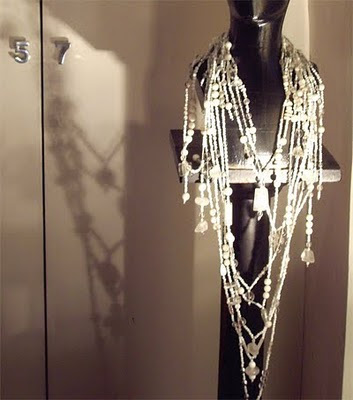 When I can see I have collected all the stones I need for a piece, I create the unique necklace in my quiet place here in Paris. I start with a pile of gems and, like an artist, compose a picture, taking into account each stone's colour, shape and size. This time of creation should be a very special moment to reflect on love and creating a thing of beauty." We talk for a while about how he goes about recognising all the physical and spiritual attributes of a stone, and translates them into perfume. "It is like a story; a movie in my mind. A lot of sensations, emotions and travels come from our dreams. Perfume is a translation of these. I work with a chemist and it is a very special collaboration. We learn together to search for the best way in which we can open the doors to the universe of imagination. There must be a good harmony between chemistry and creation". My eyes fall upon the tidy display of his perfume creations by his bureau - each bottle is accompanied by a short printed blurb, and displayed alongside the corresponding gemstone that served as the inspiration for each scent. I lift Améthyste in my hands and see three genuine amethyst beads suspended in the juice. 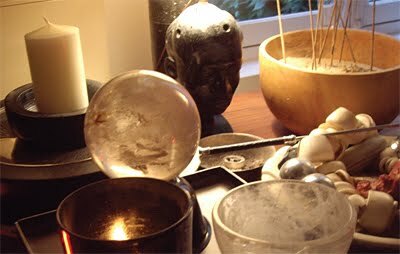 As I turn the flacon in my hands, listening to the satisfying tinkle of the mauve orbs against the glass, I wonder if the liquid has imbued the stones with perfume, or, if indeed the perfume has been released by the stones. "Which stone will be featured as your sixth perfume? ", I ask rather cheekily, knowing very well that his fifth launch Turquoise has really only just hit retailer's shelves. Olivier's immediate response catches me off guard. "Why, rose quartz of course". I turn on my heel sharply to face him, my eyes ballooning in size. I had somehow expected I would not get an answer, but am astonished at his matter-of-fact reply. "For a long time, I have thought about the creation of a perfume focused on the legend and symbolism of pink quartz; in fact, since the first step of the collection. I don't know when I will launch this perfume because I like to work step by step. I take my time to find the real fragrance which will be exactly like the fragrance I have created in my mind. I don't like to rush... it is like a meeting between ideas and events. I've begun to write a lot of things down, and have begun to mix some ingredients". When I ask if one can safely assume it will be a rose-based scent, Olivier smiles and his dark brown eyes glitter like one of his polished agate cabochons. "You can safely assume it will be a very interesting and unexpected interpretation", he says, and reveals no more. 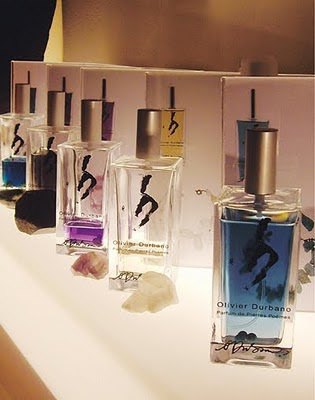 Olivier's fragrances have always been intended to be worn as one might wear a talisman around the neck. His collection of five scents to date appeal to me as an entire perfume wardrobe in itself - there appears to be something for any and every occasion. "At Pitti in Florence, I wore Black Tourmaline", he confesses. "I am sometimes a shy person by nature and occasionally feel overwhelmed in rooms full of people. I had to speak with groups of industry people; the marketers and the bloggers, so I felt Black Tourmaline best in this situation. It is a stone of protection". It fascinates me that Olivier chose to wear this perfume to empower himself in such a challenging environment, but am not at all surprised that his choices and motivations are far from arbitrary. I get a sense that every aspect of his craft is systematic, and that he relies heavily on his intuition and inner sense of what is good and honest and true. He dares to dream, and in doing so, affirms his aspirations and makes them tangible. "I dream of opening a retreat", he says, "one with rooms associated with my stones... for example, an amethyst room, decorated accordingly and filled with stones and my Améthyste perfume". I observe for a moment the environment in which I find myself... there is a zen-like calm in his atelier that can be attributed to the modest lighting, the hand-turned wooden bowls filled with incense, the exotic statuettes residing in shadowy corners, and dishes brimming with shells and coral-root collected from the shore. If such a retreat were to become a reality - and I don't doubt that one day it will - Olivier will most certainly leave his sophisticated fingerprint all over it. I tell him I love the idea. He willingly admits that he is not driven or motivated by money, and would just a much like to create such a retreat for his own personal pleasure as he would for others. When I also mention the extremely limited distribution of his perfumes (limited to only a handful of retailers internationally) Olivier reaffirms that the quality of his distribution wins out over the fiscal rewards of having his brand on every street corner. "I am always open to doing business with like-minded people. I will rarely go out and search for new avenues of distribution... rather, I wait until I am approached because this way I know they are perhaps more sincere about my product and my vision. I like to build a very special rapport with my distributors." As much as I turn it over in my head, I can't fault his professional outlook and willingness to answer to his inner voice only. He is a man who places great importance on remaining true to ones own self. Something tells me Olivier Durbano enjoys his anonymity behind the facade of Rue des Francs Bourgeois. He wakes by 8am, drinks his morning coffee whilst looking over his email, and then sits with a pile of stones and begins to construct an ornamental neckpiece with all the deliberation and precision of a professional architect. His studio space is a direct reflection of the road he has travelled, and the road he continues to explore. As our time together draws to an end, I fill my eyes one last time with prickling light as the halogens in the room pick out twinkling facets of stone. I feel as if his gems are winking at me and bidding me good bye. Olivier presents me with a lovely parting gift - a matte black box filled with enchanting 10ml miniatures of all his scents to date. I re-tie the beautiful monogrammed ribbon and cushion the gift in my hands. Despite this being an extremely generous gesture, I leave Olivier's atelier feeling as if the greatest treasure I received was the time I spent in his company. I cross the courtyard and push through the heavy double doors and lose myself in the bustling throng of the Marais. Reproduced with kind permission of Basenotes.net. Black Tourmaline is the one for me , I get social phobia. I had had taken much notice of his fragrances but I feel a connection with him now. I love semi-precious stones . I did wonder if customs thought he might stone the air-crew to death .I also wondered if the grey stone he'd fallen in love with might turn out to have been ambergris. Thank you Michael... I think there is much for you to explore there. Please let me know what you think.